This book has been awarded the Technometrics Ziegel Prize for the best book reviewed by the journal in 2010. Technometrics is a journal of statistics for the physical, chemical and engineering sciences, published jointly by the American Society for Quality and the American Statistical Association. Criteria for the award include that the book brings together in one volume a body of material previously only available in scattered research articles and having the potential to significantly improve practice in engineering and science. This book is truly unique in that it first describes case studies and key business problems, and then shows how statistics is used to address them, while most literature on the topic does the reverse. This approach provides a comprehensive understanding of common issues and the most effective methods for their treatment. Each chapter concludes with general questions that allow the reader to test their understanding of the presented statistical concepts as well as technical questions that raise more complex issues. An extensive FTP site provides additional material, including solutions to some of the applications. With its accessible style and real-world examples, The Role of Statistics in Business and Industry is a valuable supplement for courses on applied statistics and statistical consulting at the upper-undergraduate and graduate levels. It is also an ideal resource for early-career statisticians and practitioners who would like to learn the value of applying statistics to their everyday work. GERALD J. HAHN, PhD, was manager of applied statistics in the Corporate Research and Development Center at General Electric (GE) for twenty-eight years, where he was named a GE Coolidge Fellow, the organization's highest honor. Dr. Hahn is the coauthor of Statistical Models in Engineering and Statistical Intervals: A Guide for Practitioners, both published by Wiley. NECIP DOGANAKSOY, PhD, is a Statistician and Principal Technologist at General Electric's Global Research Center and is also Adjunct Professor in the School of Management at Union Graduate College. A Six Sigma Master Black Belt, Dr. Doganaksoy has written over fifty papers and journal articles on statistical applications in quality, reliability, and productivity improvement. PART I. SETTING THE STAGE. Chapter 1. Statistics: An Overview. 1.5 Better Decisions Require Better Data. Chapter 2. 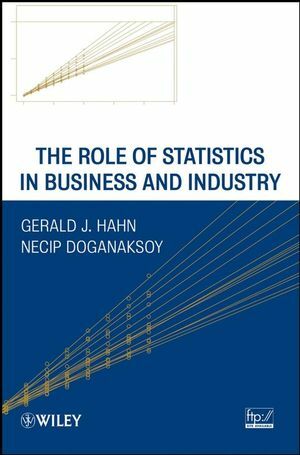 Statistics in Business and Industry. 2.2 Evolution of Statistics for Manufactured Product Applications. 2.3 Applications Beyond Manufactured Products. 2.4 Forces Impacting the Use of Statistics Today. PART II. MANUFACTURED PRODUCT APPLICATIONS. Chapter 3. Product Design: Concepts. 3.2 The Product Design Process. 3.3 Setting the Design Goals. Chapter 4. Product Design: Example. 4.2 Thermoplastic Resin for Child Car Seat: Introduction. 4.3 Some Basic Elements of Plastic Part Design and Manufacture. 4.4 Setting the Design Goals. Chapter 5. Product Reliability Assurance. 5.1 About this Chapter . 5.2 The Key Role of Reliability. 5.3 Design for Reliability: The Need. 5.4 The Process and the Participants. 5.6 Reliability Evaluation of a Conceptual Design. Appendix: Product Life Distributions and Concepts. Chapter 6. Manufacturing Quality Improvement: Concepts. 6.2 The Need for Manufacturing Quality Improvement. 6.4 Considerations in Manufacturing Quality Improvement. 6.5 Disciplined Approaches to Manufacturing Quality Improvement. 6.6 Quality Assessment and Improvement. Chapter 7. Manufacturing Quality Improvement: Example. 7.2 Generator Stator Bar Example. 7.3 Manufacturing Capability and Stability Assessment. 7.5 Reducing Deviations from Target and Variability. Chapter 8. Product Manufacturing: Further Applications. 8.2 Integrating Engineering Process Control and Statistical Process Control. 8.4 Materials and Parts Quality Assurance. Chapter 9. Product Field Support. 9.3 Reliability Data Tracking for Nonrepairable Products. 9.4 Reliability Data Tracking for Repairable Products. 9.5 Planning the Failure Reporting System. 9.6 A Note on Product Safety . 9.8 Competitive Evaluations and Advertising Claims. 10.2 Drug Development: Process Overview. 10.3 The Role of a Pharmaceutical Statistician: An Overview. 10.6 Case Study: Phase 2 Clinical Trial. 10.9 Some Statistical Tools Used in Pharmaceutical Applications. 10.10 Sources of Further Information. 11.1 About this Chapter . 11.2 Financial Services and Its Uncertainties: . 11.3 Credit Scoring for Consumer Loan Approval . 11.4 Credit Scoring Example . 11.5 Model Development and Implementation: Some Important Nitty-Gritties. 11.6 Modeling in Credit Management: A Broader Look. 11.8 Statisticians in Financial Services. 12.3 Example: Improving the Loan Decision Process for a Business Equipment Financing Company. 12.4 Steps for Process Improvement. 12.5 Another Example: Improving the Skip Tracing Process. 12.6 Some Further Concepts and Methods. 12.7 Operations Research and Management Science. 13.2 Food, Beverage and Related Industries. 13.5 Statistical Image Analysis for Medical, Security and Other Applications. 13.7 Emerging Areas: A Glance Into the Future.